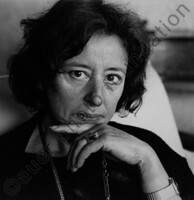 1996 she says: 'I have worked for a long time as a painter and sculptor. Now it's photography which interests me. The most important things for me are color and light, as well as a rigorous composition. In all, the plastic values rather than the documentary side. Like a painter, you can take a picture in all beauty from an insignificant subject. In order to obtain precisely what I want, it seems to me indispensable that I make my prints myself, especially for the color. The link with reality seems essential to me: it is possible to go a long way into the abstract, but personally I do not like going to the limit. It is necessary for me to understand what has been seen, in order to be interested in the way it is seen. Photography is above all, about witnessing (personally) and communication. I am not much interested in technical effects although of course, I respect them in other people's work, but more in the eye behind the camera and the mind behind this eye. There are a thousand ways of seeing the 'truth' or reality. The more there are and the more they are different, the more interesting it is. In short, photography is perhaps a way of speaking about tolerance'.